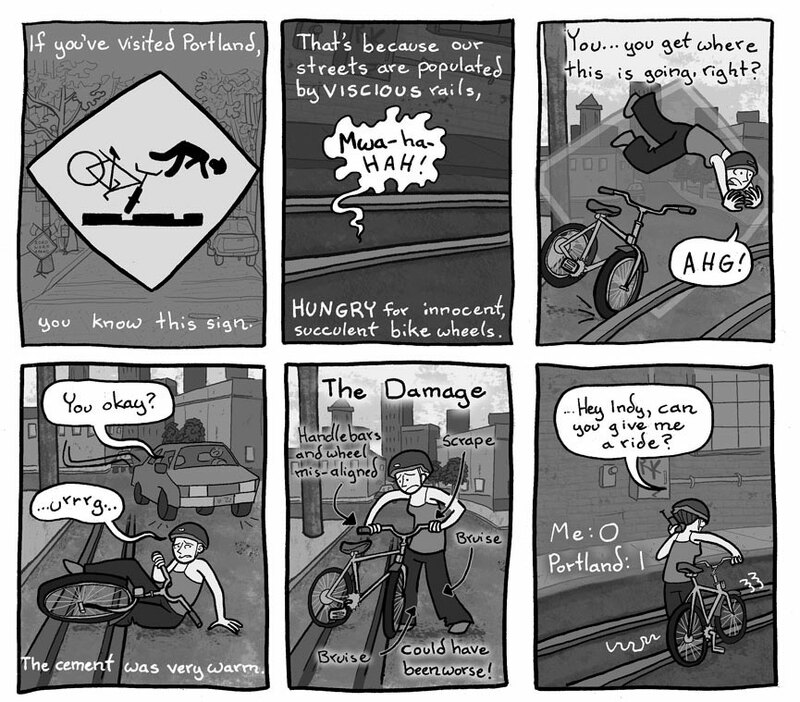 Now that I’m moving back to Portland, with my bike in tow, I will have to remember the freaking MAX rails. They’re deadly, like a mine field lying in wait. Loving this comic, I was looking for a place to put my button ad, and I came across it in Project Wonderful. Kinda reminds me of a friend I know in Portland. I hope you like the city as much as I! I have to say, I giggle every time I see one of those signs. Just found this comic and love it. I am from portland and did the head over heels on railroad tracks thing many times during my youth. I still love the max though, despite how it has tried to kill me. I ride it back and forth for ages whenever I come home to visit. This happens to be all the time when I bike around Portland (maine that is), one time I flipped over my handle bars and can a good foot from being run over by an oncoming car. it was kinda funny accually, but I have a weird almost budy relationship with death. meh, it works.